The best thing about a smoothie for lunch is that when you mix fruits and vegetables together to make your smoothie you optimize your vitamin and minerals consumption in one healthy drink. A smoothie like this is just packed with all things good for you. 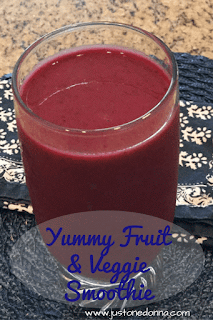 This is one of my favorite fruit and vegetable combos for a healthy lunch smoothie. Isn't the color beautiful? That deep color comes from the addition of a medium-sized, red beet. Without the beet, this smoothie is a muddy green color. It tastes yummy but doesn't look as pretty. The beet does add some earthiness to the taste but the earthiness is mild. Leave the beet out if you don't like earthiness. If you have never tried smoothies as a meal replacement I suggest you give it a try. I especially enjoy a smoothie in the spring and summer. By using frozen fruit you can get a frosty smoothie that you eat with a spoon. That's really nice on a hot and steamy summer day. Did I mention this smoothie is only 235 calories? Check out the other nutrition facts below. 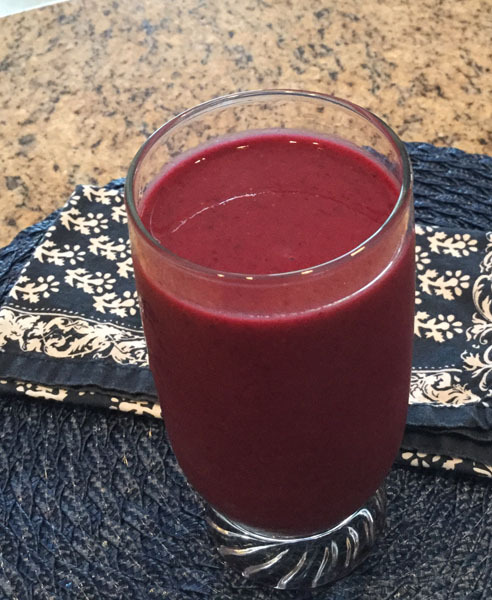 Do you want this smoothie to be under 200 calories? Leave out the banana for 196 calories and 39 grams of carbs. Place the ingredients in your single serving blender container in the order listed. If desired, partially thaw the frozen fruit in a microwave before adding the remaining ingredients. I thawed the fruit for one minute for this smoothie. Blend for 20-30 seconds, until smooth. Do you have other fruit and vegetable combinations that you think I should try? I'm stuck on this one and would love to hear your suggestions. I should mix it up a bit! Hi Donna, Thanks for the visit just now. I wanted to return the "blog love" and visit you. I will respond to your comments on my site. PS I love strawberry smoothies! Thanks for stopping by, Janice. I enjoyed your post on increasing blog page views. I'm looking forward to reading more. I can't wait to try this smoothie! It may be a great way to start my day to fuel up for my workout. It's jam packed with all that's good for your workout, Laura. Enjoy!